To Love a Rose: Merry (Ethiopian) Christmas! Well, I missed it yesterday; but I didn't want to end these past couple of busy days without mentioning that January 7th is Ethiopian Christmas (known as "Ganna")! Spending the holidays with my family this year, I found myself wondering over and over again what it would be like to celebrate with Baby C one day. I'm excited. I realize that my dreams won't be fulfilled any time soon, and that makes me a little sad. But, I look forward to the Christmas season that I will spend with Baby C - that will be a good time. So, I leave you with a wish for a Merry (Ethiopian) Christmas and amazingly blessed new year! 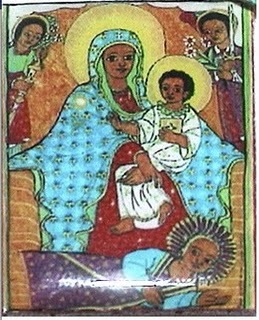 Ethiopian art depicting the "reason for the season", Jesus' birth to the Blessed Virgin Mary! I just found this wonderful Ethiopian painting on your blog. I would like to draw it, but for this reason I want to know where it is originally located. Can you tell it me please? It is truly beautiful, but unfortunately I cannot remember where I initially found it. Back when I first started this blog, I was not very good or aware of giving credit to my sources. I am attempting to go back through my older posts and remedy this, but it means that I'm not much help in instances like this. :-(. I wish I could be of more help,and if you are able to discover the origin of this painting, would love to give credit to the museuem or institution which owns it. Best of luck to you on your drawing! It will be beautiful, I'm sure! thanks for your answer Mandie. Do not worry, even if it is very beautiful, this special painting is not so important for me as you may know that the Christian Faith was brought to Ethiopia in the 1st century (Acts 8:26-40) and Orthodox Christianity itself was etablished in Ethiopia in the 4th century. According to these facts, christian paintings has spread all over the country. You will most probably find them in every Ethiopian Orthodox Church. By the way, I really like your aticle about adoptions. The way that you start with your personal problems, including the influences of your surrounding, then you seek a solution in the Holy Scripture, beginning with the old testament and ending with Jesus the Christ, is a good example in how Christians should study and live with the Bible. May God bless you continually.